I bought all this the other day..about $12 with tax.. The GSI toaster grill is for the Whisperlite and other canister/ bottle type/tiny stoves..collapses flat(6.5"x5.5"x.625") and fits in the storage bag..appears it was used once..nothing else looks as if it has ever been used,clean as a whistle. 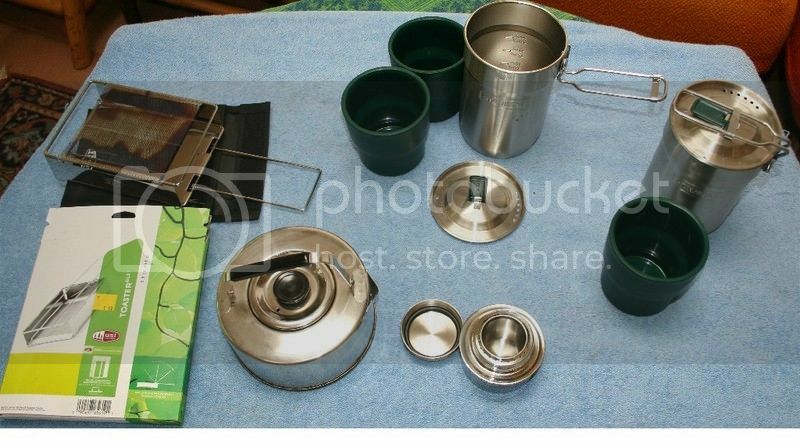 An unused TaTonka stove(down in front)...an EV hiking teakettle..a couple Stanley hiking pots..one had two plastic cups inside and the other only had one.I'm showing one together and the other apart..will hold 20oz only to the top of the "STANLEY" with about 1-1/2" to spare on top of that under the lid.It should be easy to set/makeup a windscreen cone for under the pot/over a stove because the pot bulges out at the 20oz water line!Amazon has those pots with the two cups for $15 each right now(about 1/2 price of normal..I paid $5 for the two pots). I also bought a nice European style unused stovetop Cappucinno machine..brand new,still packed in the box with the instructions(marked $59.99) for 9.99 so I'll sell that at 1/2 price and all this will be mine,mine,mine ..and I still make a profit. Just what I needed..more hiking cookware! Also not shown was a stainless Starbucks 32 oz coffee press for $2..a Lagesse La Square for $5(about $43),and a pair of small 2-1/2" high bottle jacks for $3(for inside guitars and ukulele use?I might grind the base of one down to 2" high)So..there goes my profit..It's been a pretty good few days. Re: And Seattle thrift stores come through again! That was quite a haul for so cheap. I got an MSR Rapid-fire Isobutane today for $6 in the original box with instructions,orifice cleaner..etc...like a whisperlite..